This is a 60-90 minute walking tour of the Saint Louis Cemetery #1. 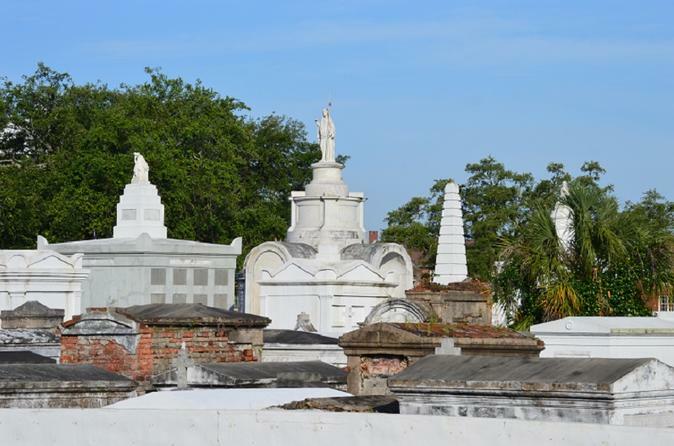 Established in 1789, just outside of the French Quarter, the city's oldest cemetery has more than 50,000 residents in this 'city of the dead'. You will be guided through the labyrinth of above ground tombs that are more than two centuries old by an experienced and licensed tour guide. The tour will meet at Armstrong Park and walk through historic Congo Square on the way to the cemetery. ONLY 15 GUESTS PER TOUR GROUP! We like to begin this tour by giving an explanation of colonial geography and life. It will help you to understand the reason of why we have our graveyards above the ground. You will learn the location and the fate of previous graveyards, such as Saint Peter Cemetery. The tour will pass through Congo Square and hear about the Code Noir and Voodoo. It is here that we will explain how music would play a crucial role in local funeral customs. Then, it is off to the main attraction, St. Louis Cemetery No. 1. Once you reach the graveyard, we will explain how we entomb our dead. You will be shown several styles of tombs and explained how they work. Though out the cemetery you will also learn to identify symbols commonly associated with death. Of course, the highlight of this tour is the voodoo queen Marie Laveau's tomb. She is not the only notable from the city's past residing here. You will meet them all! This tour will conclude outside of the Basin Street Visitors Center. 501 Basin Street. This visitor's center has public restrooms and air-conditioning! There is also a pay parking lot available for those driving who wish to park at the end of the tour. The city allows tour groups of 30 to operate, but we feel that is a disservice to those on the tour. We want everyone to be able to see and hear comfortably. Operating a group limited to 15 people will provide an opportunity to interact with your guide on a level that larger groups cannot accommodate. We will let you ask questions and not give you rushed answers.